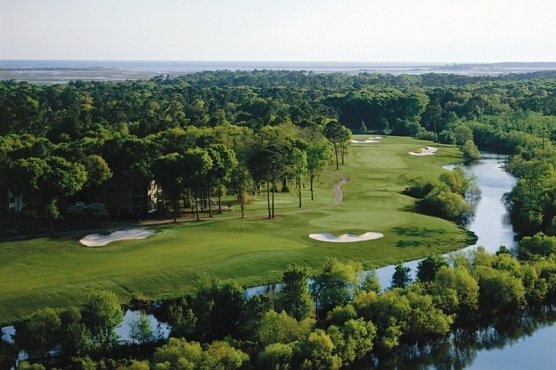 MYRTLE BEACH, SC - Built in 1974 as part of the Hilton Myrtle Beach Resort property, Arcadian Shores Golf Club was the first solo effort by young architect, Rees Jones. Almost 36-years later the course is still a great test of golf. Jeffrey Alan Wisniewski, first assistant professional, describes the course well when he states, There are no gimmicks on the course. It's well bunkered and the greens are a little sneaky. Those latter two points should not be forgotten when tackling Arcadian Shores. Frankly, those thoughts did bring some concern to the forefront. Although the day chosen to play was gorgeous, the Myrtle Beach area had been hit with plenty of rain in November and December and some unseasonably cold weather in early January. What's the shape of the course? Are those well-placed bunkers full of water? And just how does bad weather impact sneaky greens? There was no need for concern. Congratulations to the B&C Golf Management Group for presenting a very well groomed golf course. The fairways were rich and offered great lies and the greens were outstanding and rolled true. The rough was playable and at least one tractor with blower was keeping leaves off the fairways. The hospitality at Arcadian Shores Golf Club is like meeting some old friends for the first time. From the bag drop attendants to the starter, the staff offered friendly greetings. Most are long time employees and enjoy what they do. It shows. The clubhouse offers all the usual logo merchandise and has GPS rentals available. The snack bar has all your favorites. A large driving range and generous putting green provide plenty of space for getting ready. The Hilton Golf Academy is available, if your game needs a little tuning. With five sets of tees Arcadian Shores is enjoyable for every level golfer. Although the course is not particularly long from any tee box, it will require good shot making on virtually every hole. There are quite a few things to like about this venue, but two in particular stand out. First are the sand bunkers. Each seems to be strategically placed and good shot making is imperative, if you plan to keep away from them. They are large and deep with good sand. Of course you want to stay away from fairway bunkers, but trying to avoid them may leave a wayward drive in the rough, or even worse. Now, you're faced with the challenge of either going for the green, or laying up to avoid the numerous green side bunkers. Remember, the greens are a little sneaky, so it may be best to be close in three on a Par 4. The second thing that sets Arcadian Shores apart is the Par 3's. Frankly, many golfers tend to lose a little focus on the Par 3's. The Par 4's and 5's are more often the memorable holes on the courses we play. Rees Jones did a great job on the Par 3s, each distinctly different and all memorable. It begins on the 2nd hole, 148-yards from the white tees over water. The water continues to the right of the green and to the left side is a sand bunker. In both 1997 and 2004 The Sun News, the local daily newspaper, named No. 2 to the 'Dream 18'. With almost 2,000 holes from which to choose, that's quite an honor. The remaining Par 3's are equally memorable. No. 8 features a carry over water into a tiered green. No. 15 features superb sand bunkers, while No. 17 provides a real club selection challenge. Both the front nine and the back nine begin with relatively straightforward Par 5's. On the front nine No. 6 and No. 7 are great holes. A slight dogleg right greets the tee shot with a fade catching the sand bunker at the turn. A pull runs through the fairway. Either mistake turns a relatively short, slightly uphill Par 4 into a challenge. A back pin position on a long green adds to the fun. No. 7 provides an interesting opportunity. Be alert to the fairway bunker on the right and the water that protects the green. One bad shot here turns what appears to be an easy, short Par 4 into a nightmare. Yes, the tree to the left of the green really does come into play. From the white tee box No. 14 is a short Par 4 at only 300-yards. A tree lined, narrow fairway requires an accurate drive. A short iron into the green provides a real birdie opportunity, if you get it close. A birdie here certainly provides the momentum you'll need to finish strong. Arcadian Shores Golf Club is a good fit for every golfer and one that's easy to recommend for any visitor. It accommodates the long hitter, while allowing the shot maker an opportunity to play well. Add this one to your must play list.